Polypharmacy, with the average number of medicines per prescription being double (3.33 -3.60) the number recommended by the WHO (1.6-1.8). Overuse of antibiotics, with SIAPS findings showing that in 59% of patient visits to health facilities result in antibiotics prescriptions (well above the 20%-26.8% of cases that the WHO estimates actually require antibiotics). 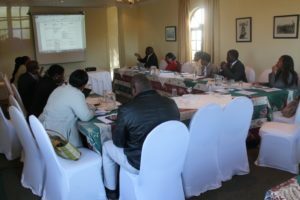 In 2012, as part of its efforts to promote the rational use of medicines by doctors and patients, the Swaziland Ministry of Health (MOH) developed its first-edition Standard Treatment Guidelines and Essential Medicines List (STG/EML). The standard treatment guidelines (STGs) are meant to assist health care practitioners to make appropriate clinical decisions at all levels of the health care system, including in the private sector. The document was developed with the ultimate goal of optimizing patient care and treatment outcomes through rational medicine use promotion. To further encourage rational medicine use and minimise the underuse, overuse and incorrect use of medicines, the WHO recommends the establishment of a multi-disciplinary national body to coordinate policies on medicine use. For this reason, the Ministry of Health commissioned the establishment of a National Essential Medicines Committee (NEMC) to maintain a transparent and rigorous process for implementing and updating the STG/EML. Provide oversight of the Pharmaceutical and Therapeutics Committees in health facilities. To ensure that the STG/EML remains relevant to the local context and in line with local developments in medicines and the management of priority conditions, the NEMC will select which medicines are considered essential for the Swaziland public health sector; determine at which level/s of care the selected essential medicines shall be available; and devise a mechanism for purchasing pharmaceuticals which are not included in the EML. The NEMC can also co-opt persons on an ad-hoc basis when necessary. These could include members representing specialized national clinical programs dealing with priority health areas like HIV/AIDS, malaria or TB, as well as other medical specialists; epidemiologists; members of the public and national health laboratory representative. Consultations can also take place with professional bodies, pharmaceutical manufacturers, or consumer agencies. Discussing work plans at the first meeting of the NEMC in June 2014. The review of the STG to include relevant priority conditions that are currently not part of the document. The review of the EML in accordance with facility VEN analyses to inform the next tender for medicines and medical supplies. The establishment of the NEMC is a commendable stride that clearly demonstrates the MOH’s commitment to the promotion of rational medicine use, ensuring supply of and access to medicine, the promotion of patient safety, and the minimisation of medicine cost to the Swazi population.